The Dogs of War: Sergeant Stubby | Will My Dog Hate Me? In the “Devil Dog” sidebar of my post about BSL last week, I alluded to the fact that Sergeant Stubby, a pit bull mix, was the most decorated dog in military history. This being Memorial Day, it seemed fitting to devote a post to him. I’d read a little about Stubby before, but until I started browsing around, I had no idea just how heroic — and popular — he was. It was 1917, and America had just entered World War I. In New Haven, Connecticut, where new recruits to the 102nd Infantry were training on the Yale University campus, a four-legged volunteer wandered in and cozied up to a private named J. Robert Conroy. He learned the bugle calls, the drills, and even a modified dog salute as he put his right paw on his right eyebrow when a salute was executed by his fellow soldiers. Conroy smuggled the new recruit aboard the troop ship S.S. Minnesota and took him to France. Discovered by Pvt. Conroy’s commanding officer, Stubby was allowed to stay after impressing the CO with a salute. 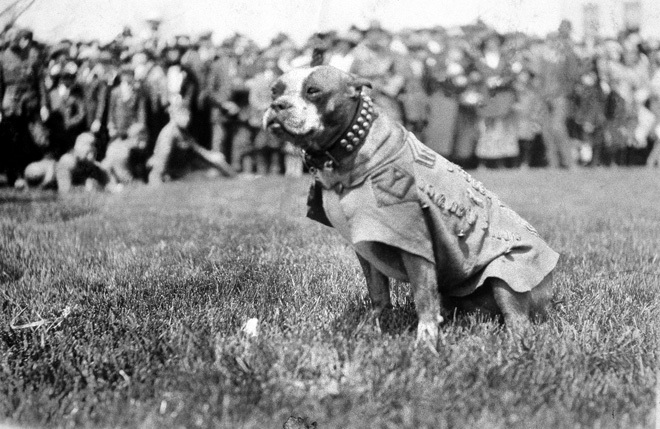 Stubby accompanied Conroy’s division to the front lines as their official mascot. An early exposure to poison gas left the dog sensitive to the smell of even traces of the airborne weapon. He alerted the soldiers to a morning gas attack by running through the trench, barking and biting at them. Stubby also had a talent for locating wounded men between the trenches of the opposing armies; he would listen for the sound of English and then go to the location, barking until paramedics arrived or leading the lost soldiers back to the safety of the trenches. He even caught a German soldier mapping out the layout of the Allied trenches. The soldier called to Stubby, but he put his ears back and began to bark. As the German ran, Stubby bit him on the legs, causing the soldier to trip and fall. He continued to attack the man until the United States soldiers arrived. This last feat of courage earned Stubby his promotion to the rank of Sergeant by the commander of the 102nd Infantry. He was the first dog to be thus honored in the United States Armed Forces. By the end of the war, Stubby had taken schrapnel and served in 17 battles. Stubby met three U.S. presidents, Woodrow Wilson, Warren Harding and Calvin Coolidge. He was given a gold medal by General Pershing, the supreme commander of American forces during WWI. He was made a lifetime member of the American Legion, the Red Cross and the YMCA. The Y offered him three bones a day and a place to sleep for the rest of his life. Between the halves he would nudge a football around the field much to the delight of the crowd. This little trick with the football became a standard feature of the repertoire of Georgetown mascots throughout the 20s and 30s and is thought by some to be the origin of the half time show. Early in life Stubby longed for a career. Realizing the value of education, the brindle and white “bull terrier” abandoned his nomadic life for that of a student. Selecting Yale University as his alma mater, he was soon recognized there as a prodigy. His progress, however, was interrupted. Though delighted with his intellectual environment and his frolics in the huge [Yale] Bowl, Stubby came to the conclusion that he ought to do his bit by his country. It was hard, after five peregrinating years, during which he had often been hungry and cold, to leave the only scene of peace and hospitality he had ever found. But in such a time, when men were parting from mothers and wives to defend the honor of Uncle Sam, was he, a mere wanderer without dependents, to think of self? 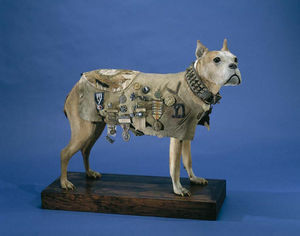 As for his final days, though some suggested he should be laid to rest in Arlington, Stubby was stuffed and put on display in the Smithsonian Institution. Undignified? That was just the fashion of the day. I’ve written about other famous dogs who underwent the same fate; it was a sign of respect. And how cool is it that you can see the originals of all Stubby’s medals and awards? Stubby sure lived a full life, and one with great purpose! We owe much to him and his pals. Thank you, Stubby! After reading a book recently about more modern military working dogs, I’ve been looking for something that features a more historical perspective. Sadly, while there are limitless biographical accounts of human soldiers, I have yet to find a similar book on canines in action. Stubby’s story is such a touching one. Thank you for sharing it. Love Stubby. Could do without Stuffy. The war dogs of Vietnam suffered a much different fate. They were trained to detect enemy mines and saved thousands of lives doing so. Then, when the war was winding down, the soldiers who cared for these doggies wanted to take them home. The brass said that wasn’t feasible, primarily for “health” reasons. They weren’t kept in a kennel though. They were treated like used-up military equipment and put to sleep. The military denied this for years, but the truth came out in the 1990s. Thanks, Lee. That’s such a sad story and I’ve been trying like crazy to find a link that was posted on Facebook yesterday. It was a political action group lobbying to change the designation of dogs in the military from “equipment” to “personnel” (or something equivalent). If you — or anyone else — knows what I’m talking about, please post it here. I don’t know how or where to steer you on that except I learned about this back in the 1990s while watching a documentary about the dogs of Vietnam. It was quite something to see these hardened veterans, tough guys all, collapsing into tears as they told stories about the unwavering courage their dogs had and the heartless way they were treated after the war was over. I hope y0u find what you’re looking for. Such a horrible story, I didn’t knew this. Thanks for the youtube link as well. I remember as a little kid reading a comic – can you imagine – on WWII where Russians send trained dogs with mines to enemy tanks and blew them up. It was my first confrontation with the fact we treat animals poorly as I remember it. The Hovawart is a breed almost annihilated because the Germans enlisted them to die on the fronts in that same war. Is it a coincidence I was as an adult drawn to the Hovawart. Maybe to protect them? Wonder what Freud would have made of that. Ok, I found it: As Dr. Marty Becker says: “Friends, working military dogs are NOT equipment. For that reason, I’d like to ask those of you in the U.S. to do something in observance of Memorial Day today. Please go to the link in this post, enter your zip code, and send an email to your Senators asking them to support Bill # S.2134, the Canine Members of the Armed Forces Act, which will reclassify and protect these dogs upon their retirement. Please ask your friends and family to join you, too. Thank you for helping honor the human/canine teams who have given so much to protect our country! The link: http://capwiz.com/compassionindex/issues/bills/?bill=61106951” JUST DO IT! 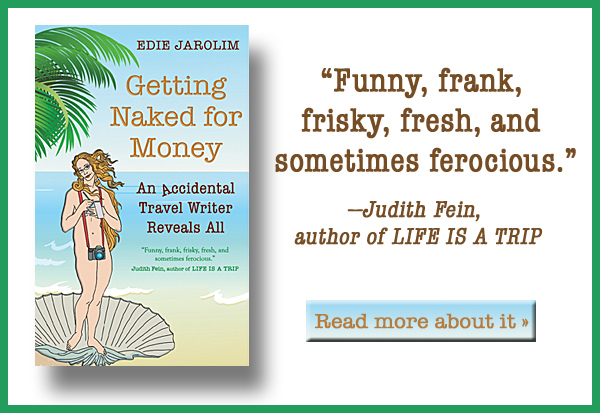 What an extraordinary story! It’s so nice to see the relationship that can develop between humans and a dog working together for the benefit of both. Stubby was quite the dog – though, I find the stuffing a little off-putting. I’m going to sign the petition now – thanks for the link! I love this! I read about Sgt. Stubby a few years ago and made a post about him on a forum I was on. Since then I have read about other war dogs and it never fails to remind me how much people rely on dogs. They were treated like used-up military equipment and put to sleep. The military denied this for years, but the truth came out in the 1990s. Thanks that you’ve shared. You’re welcome. It’s a sad story. There are now two sites in the comments that you can go to; I think I’ll put them in the body of the post. What a wonderful tale Sergeant Stubby has to tell. I wonder why Hollywood haven’t picked it up yet – or maybe I missed something. When they do, I hope they will do a better job than the Hachiko movie. And as a bonus Stubby was a bull type, I can only dream what a movie would do for the popularity of the breed (type). Oh wait, popularity is what brought them into problems in the first case. Before I start confusing myself, Sergeant Stubby could be an awesome ambassador for the bull type breeds, especially in Europe, where few people know his story and hold on to their negative prejudices. They need a positive role model and Stubby would be perfect to that end. His last job. Turning the bad rep around. That would be something.